LAWRENCE — Around Easter, Valentine's Day, Halloween or even Christmas, it's common to see grocery store aisles lined with candy and sweets. "We associate sweets with different holidays, and it's part of our celebrations, but for somebody coming from abroad, they might wonder what is this all about?" said Eric Rath, University of Kansas professor of history. Now food and cultural historians have attempted to bring together the global nature of the sweet tooth. 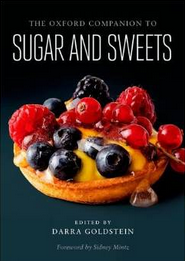 Rath, an expert on Japanese food and culture, has served as the East Asian regional editor for the new Oxford Companion to Sugar and Sweets, released this month. It's a catalog of more than 600 entries about sweets and sugar around the world. "This encyclopedia is to explain the cultural side of sweets, also the scientific side of them," Rath said. For instance, he said having a sweet tooth in Japan can be quite different than in America. 1. Japanese use the phrase "preferring dumplings to flowers" to reflect the fact that the refreshments served at flower-viewing parties often attract more attention than the cherry blossoms. 2. Japanese learned how to make sugar candies from the Portuguese more than 400 years ago. Portuguese or any Westerners who came from the south in the early modern period were known as "nanbanjin" or "Southern barbarians." Today "nanbangashi" refers to treats and sweets that came from the Portuguese. 3. Japanese bakers celebrate "Bread Day" on April 12, commemorating the first attempt to bake bread as rations for the armed forces in 1842. 4. Sugar was an expensive import in the early modern period, and Japan began growing its own sugar cane in the early 1700s after a shogun sought to remedy the country’s trade deficit. 5. Japan is the largest confectionery market in the Asian Pacific region and the largest consumer of chocolate. 6. Japanese chocolatiers like to experiment with intriguing flavors, including pumpkin, soy sauce and onion. 7. The original meaning of “sweets” (kashi) in Japanese was fruit and nuts. Sugar was not used in confectionery until the sixteenth century. 8. June 16 is “Japanese confectionery day” following a centuries-old belief that eating sweets on that day is good for the health. 9. Japanese consume approximately 350,000 tons of confectionery annually, but that amounts to only 100 calories per day per person. Therefore, it appears to be true that the Japanese prefer confections that are less sweet than Western varieties because Europeans and Americans consume much more sugar per capita annually.